The Indiana Pacers came into the 2013-2014 season with high expectations. After they were defeated in the Eastern Conference Finals by the Miami Heat, players felt confident in their ability to return the favor during the next season. The Pacers began the season with a goal of obtaining home court advantage throughout the playoffs. Indiana believed their chances of going to the NBA Finals would be greater if the crucial game 7 was played in Indianapolis. During last year’s Eastern Conference Finals, Indiana pushed the Heat to the limit. They delivered a tough and physically demanding series, in which both teams went 7 games. The Pacers began the season like “gangbusters.” Winning games exclusively by playing hard-nosed defense and team oriented basketball. Indiana had a 40-12 record at the All-Star break to go along with an impeccable home record. Nothing could go wrong for the Pacers in the first half of the season. Paul George’s performance resembled that of an all-pro, while the “wildcard” Lance Stephenson exemplified a player who was highly skilled at every facet of the game. Add in the sheer size of Roy Hibbert and the leadership of David West, the Pacers seemed to be headed in the right direction. After the All-Star break, the Indiana Pacers have experienced a drastic collapse as a team. Due to off-the-court issues and a severe slump, Paul George has regressed to the stature of a 2nd year player instead of a 4 year veteran. Lance Stephenson has resorted to a selfish brand of basketball while David West and Roy Hibbert have lost their physical style of play. Guard play has been a big problem for the Pacers throughout the season. 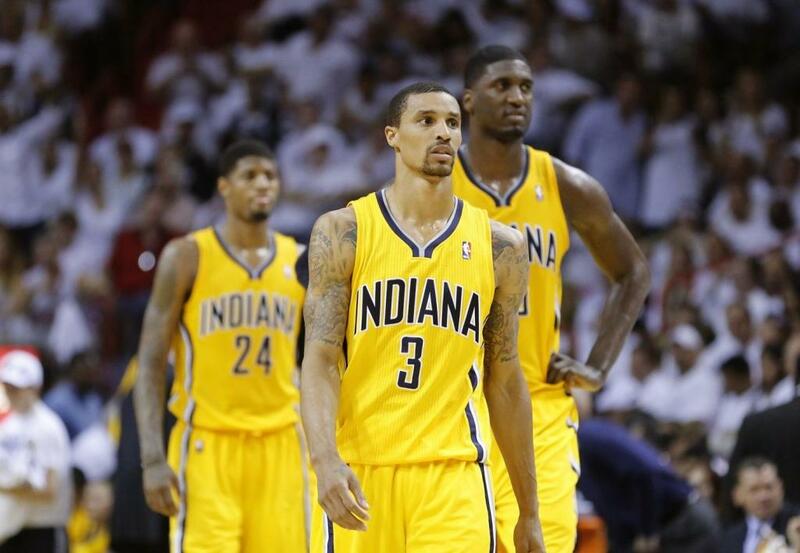 Indianapolis native George Hill is the starting point guard charged with leading the Pacers to a championship. The problem, Hill is not a traditional point guard. Indiana coach Frank Vogel is attempting to convert Hill into a guard who can lead and be the catalyst of the Pacer’s success. Hill has been a dominant scorer for most of his life, averaging over 30 points per game during both high school and college. The task of Hill changing his scorer’s mentality to that of a playmaker will be very difficult. The NBA playoffs are right around the corner. Indiana has to start resembling that team that began the season by winning their first seven games. Paul George has to become the star he is meant to be, while David West and Roy Hibbert have to dominant the paint. Steady guard play from Hill and Stephenson will be the biggest key to the Pacers championship run. If they do their job Indiana wins, if not, they have a good chance of losing early.